The rain remains with us as we load the bikes for our various trips home. Ren is keen to try getting home in one go. It is 440 miles and I must say I too am rather keen to see if I can do this. I think I can so we decide to give it a go and see how we get on. I soon settle into the riding and we just get on with the job of eating miles up on the dual carriageway. It is dull and the joy of the Highlands is now behind us but this is the price we pay. Going home is always the down time. The monotony of the carriageway is broken when we need to go in search for fuel for my bike and food for our bellies. We pull into a Tescos at Aviemore. I really like Aviemore with its stunning scenery it reminds me of an Alpine ski village. No wonder as looking around I see that it is indeed one of the country's top ski resorts. Food is found but the petrol station is not open so we have to find petrol a bit further on. I feel comfortable on the bike and feel confident I can ride all day. However as the miles stack up I begin to feel tired. The traffic is busy and requires a lot of concentration. Ren says he has a surprise destination for me, I think I know what it may be. 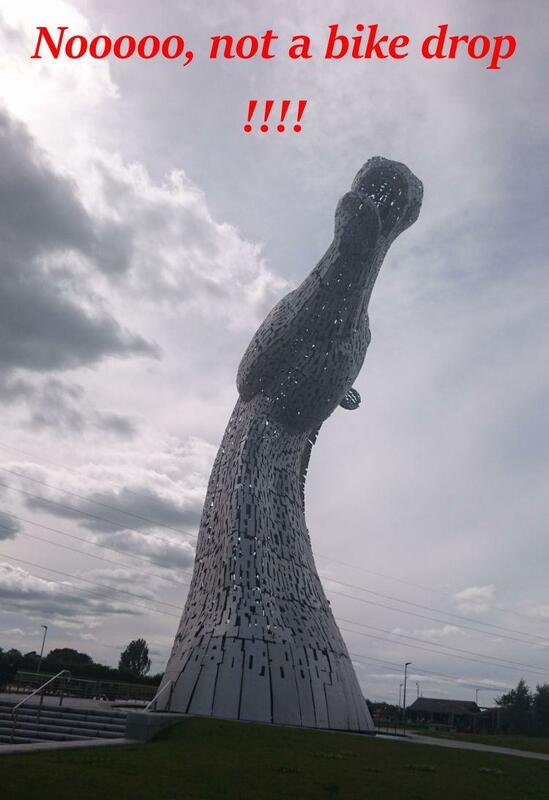 I have been hankering for some time to visit the Kelpies and I know we are roughly in that area. 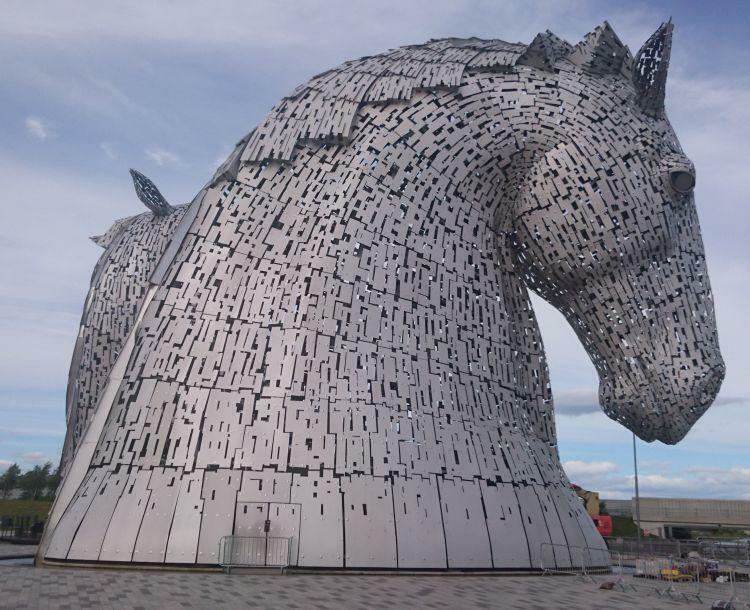 The Kelpies are 30-metre-high horse-head sculptures, standing next to a new extension to the Forth and Clyde Canal in Falkirk. 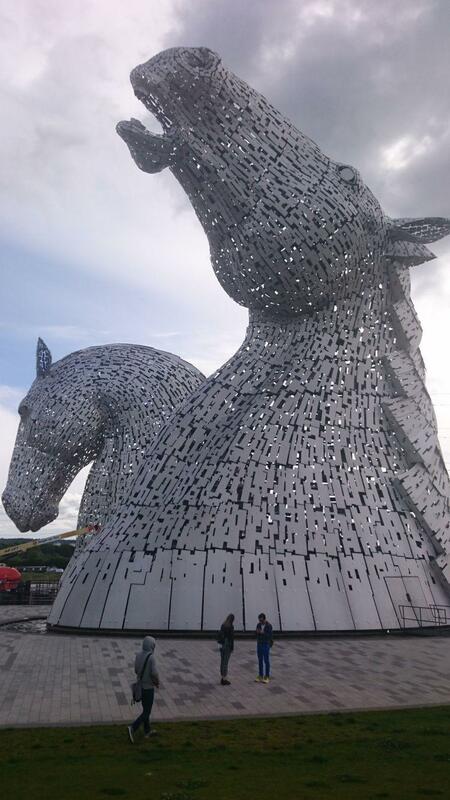 They are a monument to the horse powered heritage across Scotland. 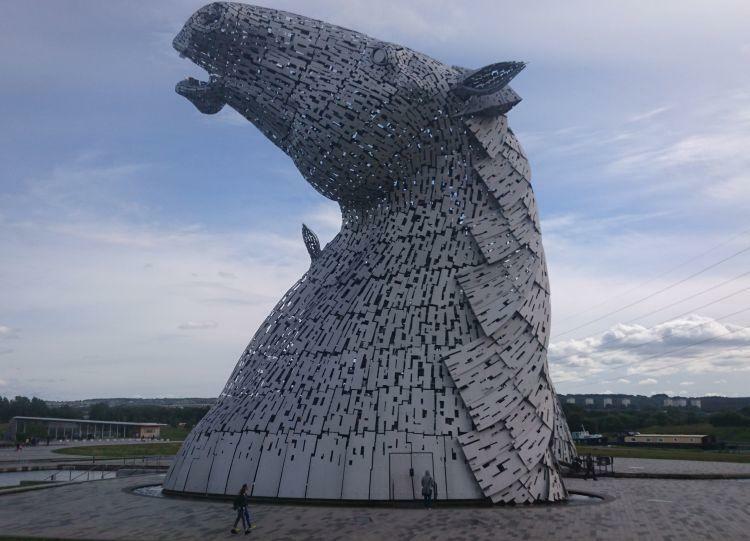 The heavy horses of Scotland pulled the wagons, ploughs, barges and coal ships that shaped the geographical layout of the Falkirk area. The sculptures look stunning in the photos I had seen so I really wanted to see them in real life. Like most young girls I was mad about horses as a child. To my mothers dismay (she would rather I was out playing in the fresh air) I spent many hours with my nose in books reading the likes of My Friend Flicker and my absolute favourite Elyne Mitchell's Silver Brumby series. If I wasn't reading about them I was drawing them and day dreaming of owning my own. I never did get to own my own horse but I did get to ride a different kind of horse power in the end with my motorcycle. 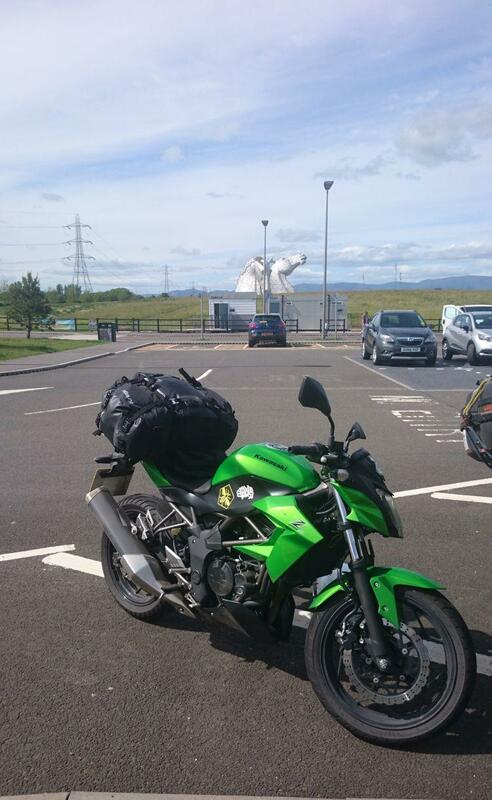 As we pull into Falkirk I am really exhausted now. I realise just how tired I am when I suddenly find it difficult to navigate through the traffic lights and roundabouts. I still seem to struggle on the bike when I am tired. 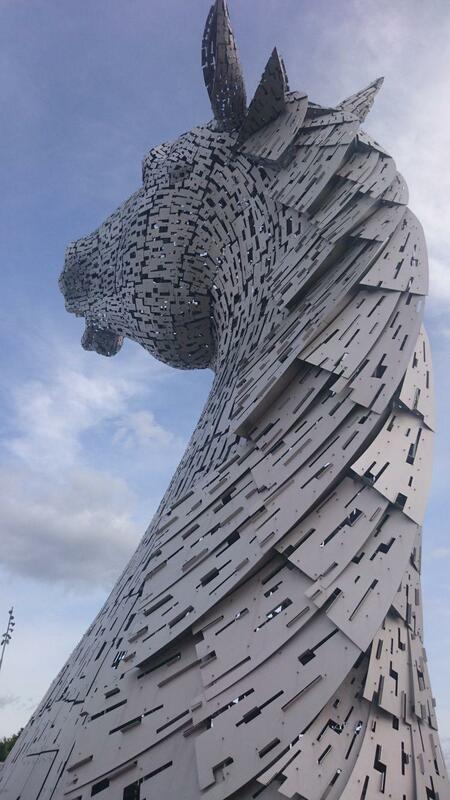 We pull up in a car park and there rising majestically before me are the Kelpies. I am so thrilled and touched that Ren has brought me here as a surprise. For a Mr meany grump he can be very sweet at times. Susssh don't tell him I said that, it will ruin his reputation. Although I am indeed delighted to be here I fear my tiredness is affecting my level of enthusiasm. I think Ren is disappointed by my seeming lack of excitement. I hope he realises I am just tired and not ungrateful of his efforts. I take photos of the horses and marvel at this beautiful artwork. Unfortunately there is some work going on and a crane spoils some of my shots. I really enjoy walking slowly around the sculptures. Viewing them from each aspect gives a total different perspective to the intricacies of the metalwork. Thank you Ren for bringing me here. When I have finished having a good look I admit to Ren that despite my earlier confidence I am pretty much done in. I feel really disappointed with myself. Just over 200 miles and that's it. Pfft. So tired in fact I opt for the closer of the two campsite options that Ren suggests. Yes I am a mile lightweight. Peebles, the campsite of choice is still some 50 miles away and I feel every mile. We spy an Asda in the distance and head towards it to stock up on supplies for tonight. We make a wrong turning, Ren turns into a side road and does a u-turn on a slope. I attempt to follow suit. Why I follow I have no idea. I should not have followed but found my own place to turn around. As soon as I ride up the slope I know it is a mistake but somehow I seem to get away with it...well almost. I go to put my feet down just as I come to a stop and nothing is there. I am really exhausted now and not thinking straight, so I make the learner error of grabbing the front back in panic. It comes with the inevitable tip to the side and me and the bike hit the floor. The bike it a bugger to lift with all the gear on it despite being super light. It takes both Ren and I to get her up. Damage is fairly minimal, a scratched mirror housing and bar end, a scuffed and scratched exhaust and a snapped brake lever. Nothing serious and because I learn from past mistakes I know I have a spare lever with me to replace this broken one. I am still angry with myself. I have had my bike now over a year, I have taken her over the Applecross Pass and along rugged roads all without a single drop. But get me on a smooth piece of tarmac with a slope and down I go. Damn it, damn it damn it. I sit down on the grass and breathe slowly to calm myself down. I recover far quicker than I once would have. Sulking and crying will not sort this out, onward as my friend Bernard would say, is the only answer. I roll my eyes at myself, dust myself off and get back on the bike. We have a tent to pitch before dark. Pebbles campsite is lovely with modern wooden pods to hire and a huge kitchen to cook in and a good lounge area to sit in. It unfortunately also has a gnarly gravel path leading to where we need to pitch up. Sod that I am too tired for this and my confidence is low after the earlier tumble. I admit defeat, get off the bike and ask Ren to ride it up the path for me. I hate not doing things for myself but right now is not the time for proving myself. Hmmm this site is perfect for the pod users, but no so perfect for motorcyclists in a tent. With the gravel uneven path to the pitch area, the barely there covering of grass in the tent field and its position as far away as it can from the toilets I get the feeling that random campers are not this site's priority. Not that this is unusual. Us campers very rarely get much of a look in if the site offers pods or touring pitches for camper vans. Ok maybe I am feeling particularly grumpy with my over tired sore body. I as usual tried to save my bike at my own expense and I have a purple bruise appearing across my palm. Food and a relax brightens my flagging spirits and I am impressed how quick and easy it is to replace my brake lever. I'm not completely useless then. 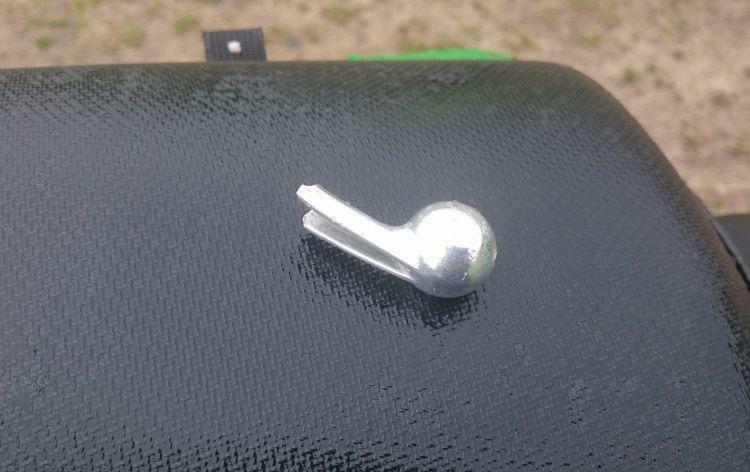 I can not ride 400 miles in a day, I still can not seem to stay upright but I can fit a new brake lever. Every day is a school day. This day is now done and so am I, time for my snuggle sleeping bag. Today has been day of mixed emotions, horsey happiness and slip sadness. A day of thrills and spills. In other words just another days biking. Spare levers make me feel better. If you ever get the chance of returning, I can recommend Peebles for a stay of a few days. It's a lovely little town with some great walks by the river and some fantastic roads. Walter Scott's home is only a few miles away too, and well worth a vist. Thanks CrazyFrog. We have merely passed through Peebles so we ought to stop and have a look sometime. There's still an awful lot of this country and Scotland where I've merely passed through rather than explored. Best get cracking! Yes, the whole Borders area is lovely and has some super (and relatively empty) roads. My sister lives in Melrose which is a very nice little town.